VR (Virtual Reality) is definitely on the horizon and one of the ‘next big things’ in the world of interactive entertainment and educational technologies. From exploring terrains or areas that learners would not be exposed to or the mountain of risk assessment alone making it impossible can suddenly transport your learners from differing perspectives such as helicopter rides over London to distant lands and the rim of a live volcano and onto an on-stage presence at gig or musical. Coupled with an immersive audio experience is one hell of a ride! but i shudder at this future and fear for the learners that will feel my pain – literally! 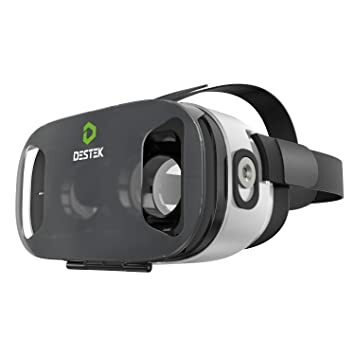 So despite all the ill-feeling I splashed out on a reasonably priced DESTEK V3 Virtual Reality VR Headset, it fits my iPhone 6 Plus (without case), is well constructed and has the Magnetic switch (a must in my opinion s for low end, low cost VR goggles). Fantastic device, if a little uncomfortable at the bridge of the nose it has allowed me(and my six year old) to go ‘wow’ at VR. Don’t get me wrong VR is still in early days (we dare not mention the flash in the pan 3D TV) but for sub £30 its a worthy expense. Yes it makes me sick but to have a ‘go’ at VR that is although not matured is not exactly fledgling either and the price tag certainly does not make my blood boil when i suffer from ‘curiosity killed the cat’, here’s hoping that the earlier link bears some useful findings to support those like me. Note: VR should not be something that you expose those under seven for any length of time!